Gates open 5pm Guy acomptition 5.30pm bonfire 6.15pm fireworks 7.45 pm. Entry Â£15 family of two adults two children, Â£6 adults, Â£3 children. 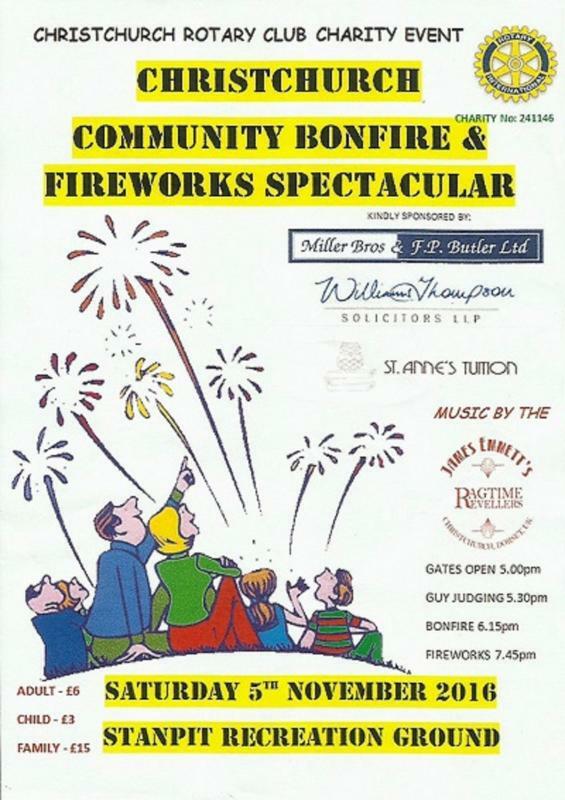 The Christchurch Rotary Community Bonfire and Fireworks is on Saturday 5th November. This is the 39th year that the event has been held with the object of providing the people of our Community an event where they can enjoy the bonfire and fireworks in a safe and controlled environment. The gates are open at 5pm and as is customary Christchurch Borough Council kindly suspend parking charges for TwoRiversmeet Car Park. People are encouraged to walk to the event if possible and entry to the site can be made either through Stanpit or TwoRivermeet entrances. Please do not attempt to drive and park on Stanpit as there will be no parking at this entry to the site. If driving follow the signs to TwoRiversmeet Car Park. Entrance charges are taken in cash only, prices have been held at £15 for a family of two adults and two children, adults are charged at £6 each and children under 16 are charged at £3 each. This year sees the resurection of our Guy Competition which will be held at 5.30, guys should be dropped off at our announcement cabin at the centre of the food arena between 5pm and 5.25pm. The winner will receive a family pass for "Wild Thing" kindly donated by Adventure Wonderland. The Bonfire is scheduled to be lit at 6.15pm, the countdown will be performed by our Deputy Mayor. Our music will be provided by James Emmetts Ragtime Revellers to get your feet tapping if you cant get close to the fire. Stalls serving food and soft drinks are provided as usual by local youth organisations, you will find a variety of goods that should suit all tastes, this is an opportunity for those groups to raise much needed funds to help them provide activities for their members throughout the year. The Fireworks are due to be set off at 7.45 pm by command of the Deputy Mayor by our professional display team from Fireworks Effects who loyally support our event with spectacular displays that just seem to get better every year. There are childrens rides provided by Wm Cole Funfair, some side stalls where Rotarians allow you to pit your skills for a chance of a win. We must thank all of our Supporters who kindly donate money time and effort to help bring this event to our community safely and with good purpose. All of the proceeds do go to local youth organisations helping them deliver their services to the young peopke of our community.All we need now is fair weather and the good people to continue their support which had been shown accross the generations. Many thanks to eveyone and our genetous sponsors who help offset some of the rising costs. Look forward to seeing you there.